*The monthly service amount is subject to certain conditions. For example if trees or bushes are hanging over pool area and regularly drop leaves in the pool this may increase the price for maintenance. It is always best to confirm your rate by allowing one of our pool experts to inspect the pool area prior to final quotation of rates. The pH is one of the most important factors in pool water balance and it should be tested and corrected at least every week. pH is the measure of how acid/ alkaline the swimming pool water is. A pH of 7.0 is neutral - below 7.0 is acidic, above 7.0 is alkaline. The pH of our eyes is 7.2 . No wonder that the ideal pH for your pool is just that - 7.2 , and should be kept within the range of 7.0-7.6 . What happens when the pool is too acidic? 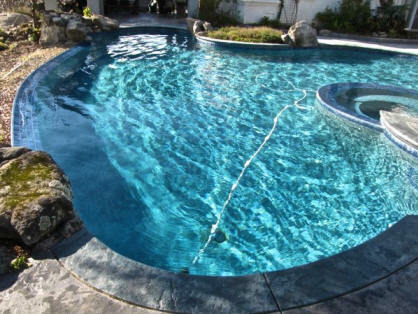 * If your swimming pool is Marbelite or plaster, the pool water will begin to dissolve the surface, creating a roughness which is ideal for pool algae growth. A similar result occurs in the grouting of tiled swimming pools. * Metals corrode - and this includes swimming pool equipment, pipe fittings, pump connections, etc. * As the swimming pool walls and metal parts corrode, sulphates are formed. These sulphates are released from the water onto the walls and floor of the swimming pool causing ugly brown and black stains. * Chlorine, which is used as a disinfectant in the swimming pool water, is activated and lost to the atmosphere very quickly. The water is not being sanitized, and we are throwing away our money by adding chlorine when the pH is too low. * When we swim, our eyes and nose burn. Our swimwear fades and perishes. Our skin gets dry and itchy. What happens when the pool is too alkaline? * The calcium in the swimming pool water combines with carbonates and forms scale, just like in our kettles. This calcification is seen most at the waterline, where it traps dust and dirt, turning black with time. * The swimming pool water starts to become cloudy or murky and it loses its sparkle. * The calcium carbonate has a tendency to plate out on the sand in the swimming pool filter, effectively turning it into cement. So your sand filter becomes a cement filter, and loses its ability to trap dirt from the pool water. * As the pH rises, the power of the chlorine to act on foreign particles is lost. At a pH of 8.0 the pool can only use 20% of the chlorine you put in. So 80% of it goes to waste and you would need 5 times as much chlorine to provide the disinfection you need. * In alkaline swimming pool water, the swimmers suffer too. Our eyes and nose burn and our skin gets dry and itchy. After testing the water, the necessary chemicals must be added to bring the pH to a level of about 7.2 .